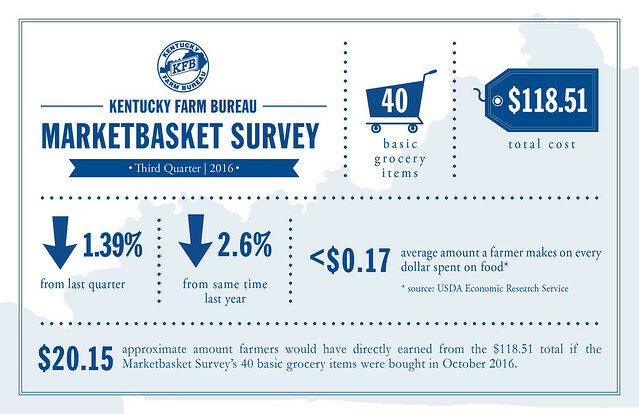 LOUISVILLE, Ky. (October 24, 2016) – After a slight increase in food prices was experienced during the second quarter of 2016, third quarter results returned to declines, according to the latest Kentucky Farm Bureau Marketbasket Survey. This marks the sixth quarter out of the last seven in which food prices have dropped, denotes the survey which represents the average total cost of 40 basic grocery items. The decrease of 1.39 percent was led by a 9.64 percent decrease in the poultry category which includes the price of eggs. 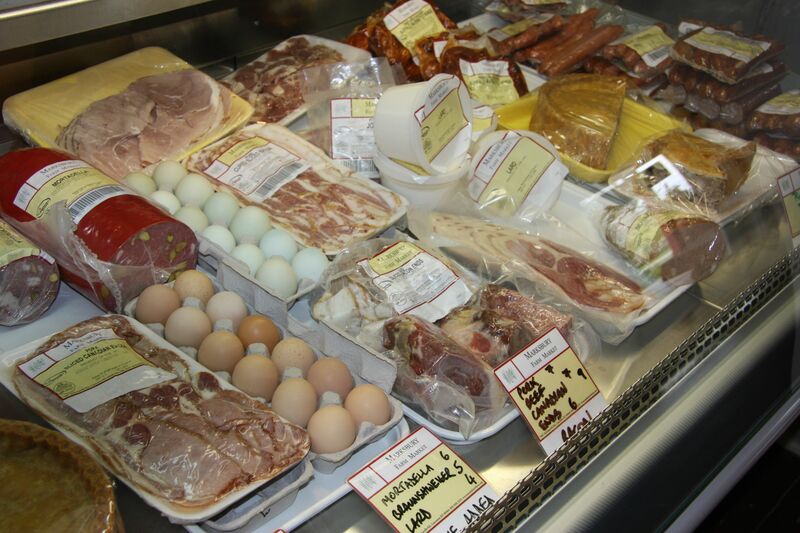 In fact, it was a $.32 decrease in extra-large eggs and a $.31 drop in large eggs that brought that category price down. During the fourth quarter of 2015, extra-large eggs were surveyed at $2.88 per dozen. The latest survey found the price to be $1.66. Overall the cost of the items totaled an average of $118.51 as compared to the $120.16 recorded during the second quarter of 2016. In addition to poultry, the next largest decline came by way of the beef category which dropped by 2.99 percent. The largest increases, category wise, were attributed to pork which jumped by 3.68 percent followed by fruits and vegetables which experienced a 1.04 percent increase. Kentucky food price decreases reflected a similar trend as indicated by the latest national Consumer Price Index (CPI) information which denoted a consistent decline in the food at home index which has seen slight decreases over the last seven months with the most recent monthly decline being .1 percent. According to the CPI information provided by the Bureau of Labor Statistics, the food at home index has decreased 2.2 percent over the past year, keeping with an overall decline experienced this year in all the major food group categories. The biggest decline is noted within the “meats, poultry, fish, and eggs” expenditure category which has seen a 6.3 percent drop since September 2015. Ham increased by $.44 per pound. Potatoes increased $.23 per 10 lb. pounds. Center cut pork chops jumped by $.28 per pound. Rib-eye steaks declined by $.61 per pound. Cheddar cheese dropped by $.31 per pound as did Red Delicious apples. Americans enjoy some of the lowest food prices in the world.